PRIXM is a movement taking back the power of tech to enable real connection through stories. It is more than a social media app. 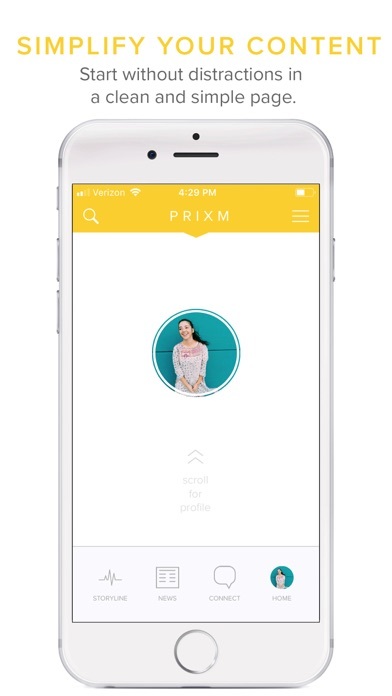 Powered by your stories and real connections, PRIXM is a “happy” app focused on you. We reject algorithms, “likes”, ads, and selling of personal information; our only focus is to empower you to document your life, and create communities that you care about. 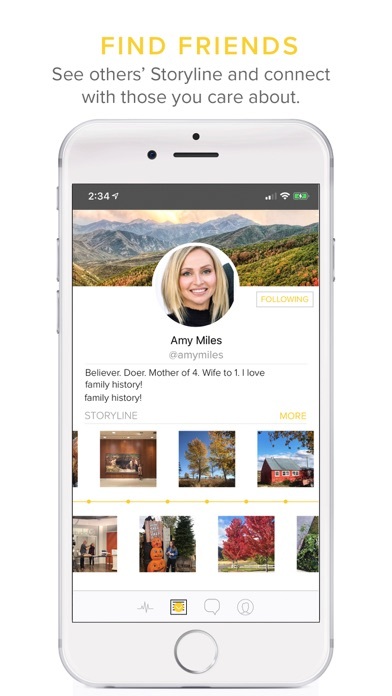 Features: •Document your story for yourself and your loved ones. •Your story, your way—options to make individual posts public, private, or personal. 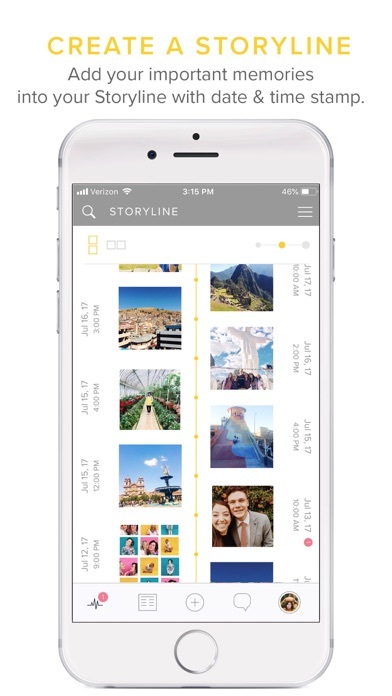 •Storyline—vertical or horizontal chronological storylines with posts of images, text, video, or audio. •Storytelling prompts—optional prompts assist in documenting the things that matter most, the things that make you who you are. •Simplified design to eliminate distraction—the focus is on you and your content. The beautifully minimal design keeps your space feeling clean and genuine. •True connections—a newsfeed in chronological order to connect with and follow the people important to you. •Organize what you see—create newsfeed filters so you can look at what you want, when you want. 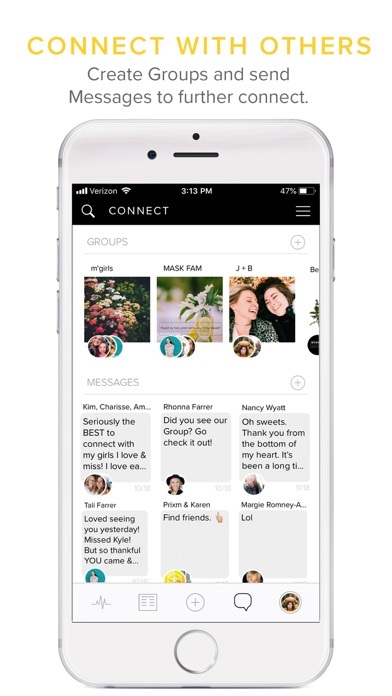 •Create communities—respond via text, picture, or video in groups and chats to strengthen relationships. •Healthy stopping points—no infinite scrolling to ensure you stay in control of your experience. •No algorithms. No numbers. No ads. PRIXM empowers individuals and communities. As parents, business owners, and friends, we’ve been deeply concerned with the effects of traditional social media. To help combat this, we’ve partnered with THE NEW NORM, a non-profit that educates communities on the harmful effects of social media, and empowers them to create true connection. I absolutely love prixm. It feels mire personal and welcoming. No need to feel perfect and post the perfect thing. This platform is for sharing our real moments and then coming together as a community to love, care for, and welcome everyone. Love the feeling I get when on this app! This app is everything!! Social media used to be a place for me to document my family’s and my stories, and connect with people I care about. More and more I’ve decided social media’s just not a place for that anymore, that is, until Prixm! It’s amazing to be on documenting my story and connecting with others, and leave the app feeling happier! The storyline is everything, and I’m starting accounts to document each of my kids stories too! Thank you for having a clean platform where I can connect and share what matters, and not get caught up in what doesn’t. Thank you thank you. Now to get all those I love on here too! I love this app!!!! THANK YOU! I am finally in control of my online experience instead of being a product. I Choose to act rather than being acted upon. Goodbye social media overlords. Hello freedom! Hello Prixm!!!!! I love PRIXM!!! I don’t have to worry about coming across any questionable content, and love the family/friends filter. My favorite feature is how you can post in the past, and you can make your posts private or public. PRIXM is AMAZING and has changed the way I view social media. I want to give this 5 stars, the reason I can’t I’d because I don’t have enough friends on this platform to truly navigate myself around. So with my limited navigation and use, I really like it. Love this APP. I’m using it as a photo journal. Love the private feature so I can keep personal items personal, but also share other items with friends. Love the vertical and horizontal option too! I am so grateful for the team behind Prixm— I love their vision and everything that they’ve done here to provide us a place to create and share moments, and grow a timeline of memories. I love that I feel 100% comfortable inviting my daughter and all of her cousins & friends onto this platform, where they don’t have to worry about so many of the negative aspects of other social media channels. This is a place where I actually want to invest time, create groups and connect with people I love and admire! I love how it knows the date of your pictures so it lines them up in the right order!! Also love how you can set it to public or private! I love that I can live in the moment and post things late, but still have the correct dates posted so “our story” remains in tact and preserved for future generations. Grateful for a safe space to share! Using PRIXM has been such a huge change from instagram and such a breath of fresh air. I didn’t think I’d care about the numbers or stats but it’s amazing having them gone! It really does feel so much better. The design is gorgeous and I love how intentional it all feels. I’m so excited to record and share but also just to have a personal journal I can someday print and make into beautiful photo books! I really love this app. The storyline is a feature I adore because it’s refreshing to have a visual on all of the seemingly unconnected events in my life come together in one cohesive storyline. (I’ve moved a bunch of times and some experiences have felt disjointed). I know this sounds weird but it makes my life feel more whole! Maybe because I’m a visual person. Try it for yourself. I’m also so happy with the ease of journaling- I have a walking journal at all times. I love the simplicity of this app and can’t wait for my family and friends to join! I love this new app! No more glancing at the “likes” number and feeling left out. It’s all about sharing our stories and journaling for ourselves or our private groups if we want. Check it out, Devin and Rhonna and the rest of the creators did an amazing job putting this together and I know it will just keep getting better!! No ads. No algorithms. Clean content check. Safe for kids. Great for social media sharing or personal journaling. Thank you to the developers!!! I really love how you can go back in time to upload pictures and whatever you like. I also like the three different ways you can view your story line. I hope they will add a way to upload more than one photo at a time. Such a fantastic way to tell your story with cool journal prompts. Very easy to use. Pictures and videos both accessible. This app brings happiness. It’s a wonderful way to record my family history. The future of social media!! Love this app. No tricks. No algorithm. Just a lot of connecting through sharing our stories! Thank you for creating this app! Love it! I especially love being able to upload ‘old’ photos and having them show up chronologically. Journaling and sharing with family in the same place! I’m used to having to journal in one app and share with my family and friends in another. It’s very refreshing to have it all in one place. I really like it. I also love how it puts posts in chronological order so I can easily post about things I never wrote about when they happened. Hurray! Love everything about this so far!!!!! Best app ever! This app is so easy to use. Helps keep priorities straight and focus on what really matters in life! I love every feature and the ability to keep things private or to share. The prompts keep me purpose driven in the moments I capture. When adding captions to photos, I imagine my children reading them someday. This app has much more meaning and gives me the opportunity to tell a story through photos and even audio! Without worrying about privacy settings! Real time updates rather than an algorithm controlling what I see is number one!! I wondered at first what PRIXM would add that I don’t get through Instagram (apart from not using algorithms to influence who/what I see or ads), but I’ve found that, for me, there’s something about this app that prompts a greater deal of thoughtfulness and openness. Instead of just posting pictures with a snappy caption, I’m really thinking about what and why I’m posting each picture, what those moments mean to me, and why I want to remember them. It’s incredibly refreshing. I hadn’t realized how some of my other social media habits and consumption had been affecting me until I started using this app. I can actually feel the difference. Thank you for making such a thoughtful and “happy” app. This is what social media should be! Everything you’ve wished for! I feel like I am in charge of what I see and how I see it. I can sort and find just what I need when I fell short on motivation or am craving connection. No endless scrolling, no “how many likes” comparisons, just a clean flexible meaningful way to journal and communicate. I want to tell the world so I can gather my peeps all under the PRIXM umbrella!!! Perfect for documenting everyday life! I've been looking for something that I can use to document everyday life in simple and fun way and this is it. I can control who sees what I post and the storyline view keeps me motivated to add stories. Finally a social media I look forward to using. Thanks. Fantastic alternative to the old social media options. Good for connecting, journaling, etc. A real app. It is refreshingly different and an authentic way of sharing. A happy place where I can share or keep my story private and beyond anything else keep it real. This app is for me to share and not to be worried about the negative feelings of social media and the “numbers” game of likes. It’s freedom to record MY story in he way I want for who I want to see it and connect with. The thoughtful principles of the creators are so true to what they have produced in this app. Just download it and see for yourself. This app restores what I originally enjoyed about social media and has done away with most of the crap I don’t like. It’s great to have a place to share with close friends and document the families life without all the extra noise. This app changes the social media game! You own your content, No algorithms, chronological timeline, post editing if you spell something wrong and best of all... full of light. 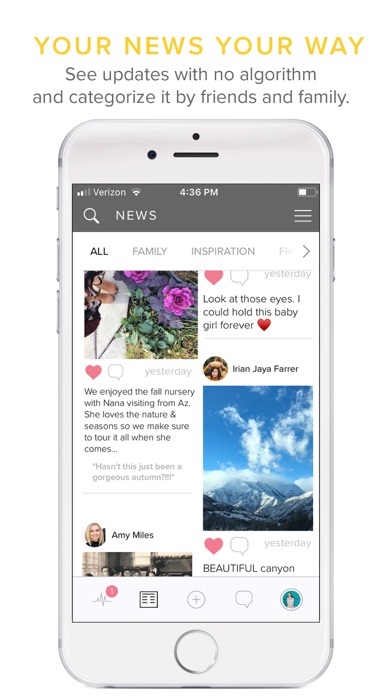 Imagine a way to really share stories with friends and families without ads and imagine an app that doesn’t present pornographic photos in your news feed... this is that app! This team thought through the problems with social media today and balanced it with our need to connect and share. Well done PRIXM team! I have loved my experience on PRIXM! It has allowed me to stay connected with my family without all the negatives of other platforms. For example, PRIXM is totally clean. On other sites, my children can find inappropriate content so easily, and this app protects families by making sure all content is clean. I also love that there are no ads! I have found my new favorite social media platform. Finally a safe place to connect with family and friends! I love this app!! So much good!! Changed my relationship with social media. This app has completely revolutionized my experience with social media. Other apps, like Instagram, are not built for the benefit of users-they are build for the institution, as they use methods such as algorithms, advertisements and numbers to create an experience that gets addictive and negative. PRIXM is totally different-it doesn’t show numbers or followers, and it has controls built in to protect kids and families. It has reminded me of everything that is good about social media, like connection and telling and preserving our stories. I have absolutely loved my experience with Prixm! I love this app. It is truly a positive experience for sharing and documenting events in my life. There are no ads which is awesome! The clean content filter means no surprises when scrolling through newsfeeds. It’s not the least bit commercial and posts can be private, public or just shared with those you want to share with. And if I know Rhonna and Devin and the team behind this there will only be more good things coming with this app. Grateful to have this available and thankful for the PRIXM team and their vision to make Social Media a positive experience. Tell your story, your way. Create communities of friends, family, and businesses. 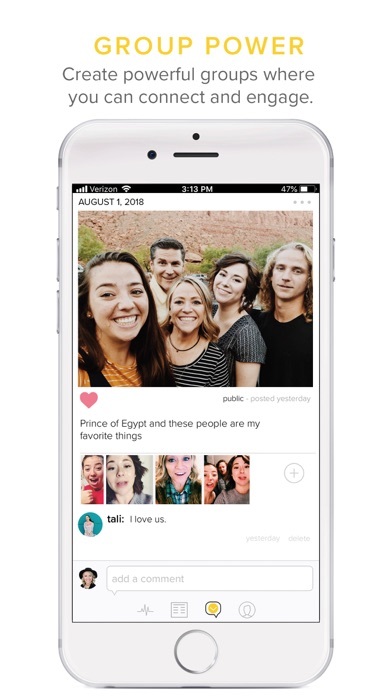 Connect via photo, audio, video, or text and do it chronologically. Post publicly so everyone can see your posts. Post personally and only you can see your posts, or post privately so just you and your private followers (folks who have requested your permission to follow you) can see. There are no algorithms, no ads, no numbered likes. This is a happy and safe environment. And, IT’S FREE! !